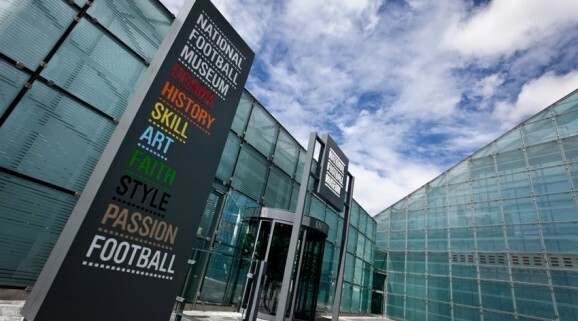 From Monday 14 January 2019, the National Football Museum is charging an admission fee. Please click here for full details. As well as access to all our fantastic displays and exhibitions, your ticket to the museum includes a photo opportunity with one of our famous trophies, a tour of the museum and access to our interactive football experiences*. All tickets are valid for one year from date of purchase, so remember to keep hold of your receipt! The museum is a registered charity and your ticket helps support our work with local community groups, our volunteering programme and of course to update our displays and exhibitions. * Make your visit even more memorable by buying extra credits for our Penalty Shootout experience. If you’re planning a visit and are aged under fourteen you must bring an adult with you. If your children are under twelve then you must accompany them at all times during your visit – this keeps everyone happy! We rarely refuse admission to anyone but if we do it’s for the health, safety, happiness and enjoyment of our visitors and our staff. Guided tours are available every day, on the hour from 10:30am until 3.30pm, with Going to the Match tours running at 11:30am and 2:30pm on weekends. If you would like to take advantage of a guided tour, please book in at the main entrance when you buy your ticket. We’re based in the city centre in one of the most visually striking buildings in Manchester. Called Urbis, our home is a unique building designed by Ian Simpson Architects. The glass building has six storeys and a distinctive sloping form. Our galleries are spread over several floors and full details of what can be found in our ‘What’s Inside’ section. Closed: Christmas Eve, Christmas Day, Boxing Day, New Year’s Day.